This season looks to be pretty exciting with a crop of returning runners to try to begin a new chapter in Hawaii cross country. With the graduation of Hawaii high school hall of famer Bryce Jenkins, it opens the door for another outstanding runner, Margarito Martinez. He placed 4th in the state last year and is without a doubt the favorite. However, there are rumors that he has over the age limit, him being a supposed "19-year old sophomore" (well now an upcoming junior). I'm not sure if there is a scandal, though I highly doubt it. Does anyone have information on the Martinez issue as to whether or not he is athletically eligible for this season (and all of these rumors are false)? If he is eligible, he will most likely wipe the floor with the competition this year. Without a doubt. There is only one runner currently that I feel will challenge him, but other than that, he should wipe the floor with his competition with his continued growth (he is only a junior). Leilehua, Iolani, and Kamehameha-Kapalama are obviously the favorites. Leilehua brings another powerhouse squad with Martinez, White, and Igarashi, all who did well at states last year. Having two top six finishes will really boost a team. However, Iolani (Esaki, Higa, Ellison, Chun, Pleskacz) returns a stronger crop of runners, and Kamehameha-Kapalama (Thibodeau, Sainz, Kahawai, Holt, Sato) also has a strong returning squad. I predict an incredibly tight three team race, with Iolani winning it and Leilehua placing second. Castle (Pak, Lee), and Aiea (Honeker, Kamoe, Miller, Dominguez) return very strong teams as well. Castle has a strong cast of runners coming up, and Pak and Lee make for a great one-two punch that really helps them point-wise. Coach Terauchi from Aiea seems to breed very good runners at a consistent basis and this year is no different. Last edited by UnitedFront on Tue Jul 28, 2009 11:04 am, edited 5 times in total. Thank you for the update, please keep us posted and continue to give us your insight on this sport! Do you know if we have any D1 prospects locally this year? 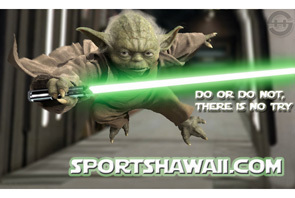 "Hawaii's Fan Based Sports Page"
Not that I am aware of. Due to Hawaii's lack of exposure and times that don't compare to mainland competition, they tend not to take Hawaii runners really seriously. Last year the only D1 prospect I knew of was Bryce Jenkins. Jenkins was a three-time state champ, yet at a western regional could only amass 50th place. The competition is getting tougher, however, and just like many other sports in Hawaii, cross country running is beginning to find its way to national recognition as a legitimate breeding ground for D1 prospects. Margarito Martinez well "not" become champion this year.There are three more outstanding runners in which you failed to talk about. Pierce Murphy (Island School), Nicola Perez-Garreaud (Maui High), and Rocky Balala (Maui High). Pierce Murphy was runner up in the 1500 and 3000m on this years State track championship meet, taking down Margarito who took 4th in the 1500. This kid is field with talent! one of the favorites to win this years state title in cross country. Nicola Perez-Garreaud took 5th in this years state meet in the 1500m. He was the national freshman leader in the 1500m till this past month. He was unlucky and had ran a bad race at last years state cross country meet and took 60th. Rocky Balala who was second to Reid Hunter in last years MIL champion, and who as well took 5th in this year state track champion in the 3000m run. Also taking down Margarito. All four of this runners to me are favorites,Margarito Martinez doesn't have this years title handed to him. He well have to fight for it, because there is better and younger talent then him. This year cross country season well be an exciting one for the boys because this title could go to anyone. xcon3#fan wrote: Margarito Martinez well "not" become champion this year.There are three more outstanding runners in which you failed to talk about. Pierce Murphy (Island School), Nicola Perez-Garreaud (Maui High), and Rocky Balala (Maui High). Pierce Murphy was runner up in the 1500 and 3000m on this years State track championship meet, taking down Margarito who took 4th in the 1500. This kid is field with talent! one of the favorites to win this years state title in cross country. Nicola Perez-Garreaud took 5th in this years state meet in the 1500m. He was the national freshman leader in the 1500m till this past month. He was unlucky and had ran a bad race at last years state cross country meet and took 60th. Rocky Balala who was second to Reid Hunter in last years MIL champion, and who as well took 5th in this year state track champion in the 3000m run. Also taking down Margarito. All four of this runners to me are favorites,Margarito Martinez doesn't have this years title handed to him. He well have to fight for it, because there is better and younger talent then him. Perez is a great runner, but his poor states performance make me wonder if we'll see a repeat letdown next year. How did he do in the MIL Championships? Balala will get better, but hasn't proven himself YET in the cross country world. Cross country is a different sport than track, some people excel at one while doing bad at the other. But if anyone knows anything about sports in general people get incredibly better from their freshman to sophomore year (or first to second year if not starting as a freshman). If Murphy is back, I would definitely pit him as the only challenger to Martinez. Remember that Martinez was sick at states and had a bad race. Martinez is an absolute beast on the courses he runs at and Murphy will be his only challenger, if any. Perez-Garreaud took 5th as a freshman at the MIL Cross Country Campionship last year. What do you mean by his poor state proformance? and do you think he well be an outstanding runner in the future? I do agree about what you said about Balala. He still has to prove him-self. xcon3#fan wrote: Perez-Garreaud took 5th as a freshman at the MIL Cross Country Campionship last year. What do you mean by his poor state proformance? and do you think he well be an outstanding runner in the future? He only took 60th at states. I do believe Perez will do well, but I don't have him placed in the top 10 just yet. Once I see results from this year, I can recalculate standings appropriately (even then, however, some tend to "sandbag" it until they need to). I know he will do well, and he will only continue to improve (as long as he continues to work hard). Cross Country is one of the most difficult sports to maintain skill in. With other sports, you can sit on the side and relax, but you can still do well in the sport as long as you have kept a majority of your natural and gained skill. With cross country, it's hard to keep yourself in shape, and even sitting out for a couple weeks is detrimental to your success. Look at Ali Keith of Mililani, on the girls side. From what I was told, she kind of relaxed towards the end, and ended up with her poorest performance at states in her three years of high school, fifth. Hopefully this doesn't happen to any of our top runners, and hopefully we get another surprise. Speaking of Ali Keith, I've also composed a top 10 girls list. Punahou is easily the strongest team in the state. A returning cast of 6 from last year's state championship team (including three freshman) make them the team that will most likely not be beaten. The only team that will really test Punahou is Mililani, who also returns 6 (including my number one ranked girls runner Kristin Ali Keith). In addition, they gain a runner who was injured last season who did very well in track, and apparently have a good intermediate class coming up. Punahou and Mililani have really bred these programs well, and it will be a treat to see these two duke it out. Watch out for strong returning squads of Seabury Hall and Iolani as well. I need to correct United Front. Bryce Jenkins finished 34th at the Footlocker West Championship-- not 50th. Let's not forget that Bryce was out all season with a stress fracture and just returned 3.5 weeks before that race. All the kids he was racing against had hundreds of miles behind them. Bryce beat Alaska's superstar Trevor Dunbar the year before-- and Trevor finished 2d place in 2008. Do the math-- if Bryce was healthy and trained-- he would have finished in the top 5 and probably won the race. He will excel at Idaho State this season and be very competitive in the NCAA. As for this year-- Margarito will likely win and Pierce will challange. They will clearly be the top 2 by a longshot. Shawn Nakata will have Leilehua postered for their 3d straight State Championship Title. Never count the Mules of Leilehua out. The gained a bunch of new runners this year and they are very solid. Nakata knows how to have the Team ready when it counts-- he won't over-train the kids to have them fizzzle out when it counts. P.S. Martinez is not over the age limit-- so get that out of your system. He has two more years to run and he WILL dominate! RunningFan wrote: I need to correct United Front. Bryce Jenkins finished 34th at the Footlocker West Championship-- not 50th. Let's not forget that Bryce was out all season with a stress fracture and just returned 3.5 weeks before that race. All the kids he was racing against had hundreds of miles behind them. Bryce beat Alaska's superstar Trevor Dunbar the year before-- and Trevor finished 2d place in 2008. Do the math-- if Bryce was healthy and trained-- he would have finished in the top 5 and probably won the race. He will excel at Idaho State this season and be very competitive in the NCAA. Thanks for correcting me. I was ill-informed I guess. Dunbar is a beast though. Jenkins will do great at Idaho State, which already has an incredible Cross Country program. The folks at Idaho State are excited to have him, he has his own article on the Idaho State athletic website. But I digress. The Martinez/Murphy saga will be similar to Jenkins and Nakamoto, no one was close to them. But then again, no one was at the level Jenkins was. I kid you not, I've seen Jenkins TIE HIS SHOES during a race (the OIA championship). I've never seen a runner so above his competition that he's able to do such a thing. Nakata's a great coach. Year after year he produced quality talent that produce. I definitely won't count them out, the state championship could sway either way (even possibly Kamehameha). I feel Iolani will win in a tight one due to the amount of talent (young talent which is noteworthy). All it takes is a few good run and the state final could go to anyone. Iolani has three in the top 10 in my mind, though Leilehua's runners will continue to do well. They have a good crop of junior varsity runners which will bask in success this season barring any unfortunate injury. And thank you for ending that stupid rumor. All those speculators that feel he is old should know this. Wow, if Martinez wins these next two titles, Leilehua will have FIVE STRAIGHT individual titles! Incredible. United Front-- thanks for your posts. I enjoy reading your thoughts. I agree w/ your logic and it will be a fun year to watch CC in Hawaii. I too am impressed w/ P. Murphy. He and Mike Martinez will provide some thrills this year. Hope to bump into you at the races. I admit that I will miss watching Bryce this year-- it was hard to watch him sit out most of last year. I saw him walk the Big Island Course during his injury and the crowd erupted as he walked over the finish line. What a humbling experience for him-- but he kept the focus as he knew he would return to race again in a month-- and this time to win the race. I also had the opportunity to listen to Jenkins give a pep talk to his squad just before the state championship. He was able to take his team (that was not the most talanted squad that day)-- and lead them to another title. Amazing! It would not shock me if Leilehua was right back in the hunt. Mike Martinez had the chance to learn from Bryce over the last 2 years-- and Shawn Nakata knows how to close a deal. To think the Mules of Leilehua won't be there at the end of the season to make it 3 in a row would be absurd. I'm ready to make the trip to Kauai now! RunningFan wrote: United Front-- thanks for your posts. I enjoy reading your thoughts. I agree w/ your logic and it will be a fun year to watch CC in Hawaii. I too am impressed w/ P. Murphy. He and Mike Martinez will provide some thrills this year. Hope to bump into you at the races. I admit that I will miss watching Bryce this year-- it was hard to watch him sit out most of last year. I saw him walk the Big Island Course during his injury and the crowd erupted as he walked over the finish line. What a humbling experience for him-- but he kept the focus as he knew he would return to race again in a month-- and this time to win the race. I also had the opportunity to listen to Jenkins give a pep talk to his squad just before the state championship. He was able to take his team (that was not the most talanted squad that day)-- and lead them to another title. Amazing! It would not shock me if Leilehua was right back in the hunt. Mike Martinez had the chance to learn from Bryce over the last 2 years-- and Shawn Nakata knows how to close a deal. To think the Mules of Leilehua won't be there at the end of the season to make it 3 in a row would be absurd. Yes, I'm sad that we didn't get to see Murphy run at states. Not sure why, he did win the KIF I believe, but was nowhere in the states results. I agree, Leilehua will gain a lot from the knowledge and expertise of Jenkins. Jenkins is one of the best runners Hawaii has ever see, and to be his teammate to learn and such is vital. It's like being a teammate of Michael Johnson or Usain Bolt. Imagine how better you become just by listening to what he has to say. Leilehua has a legitimate chance to win it again. Does anyone know of any runners Leilehua is bringing up or transfering (you never know seeing as though they have kids from Schofield that transfer) that will immediately make an impact and further Leilehua's desire for the three-peat? What are your thoughts on Iolani and Kamehameha though? They each return five runners, and who knows what they're breeding at the JV and Intermediate levels. Leilehua increased their bench over the summer. I know that their success last year has spilled over to many more kids out for CC this season. Biggest question mark is Shannon White's return. Believe that is still up in the air. If he does return, he can be a top 5 runner in the State. I will watch the Mules closely over the first few races. As for Iolani and Kam-- both will have solid Teams. Iolani had the most overall talent and deapth last year and is the clear favorite outside of an unexpected injury scenario. Kam has a solid program as well with some new faces this year. I still don't know how any public school can compete w/ the big 3 private schools with their recruiting, huge pools of athletes to pick from and ability to take the best runners from all islands and even from the mainland. It really isn't a fair and even playing field for the public schools as their programs are small and limited. With that said-- it makes Leilehua's accomplishments and Shawn Nakata's achievements even more amazing. In my opinion-- he could go down as the best CC Coach of all time. All in all-- it's time for 1 of the big 3 private schools to produce another Div I cal runner. Believe the reason Pierce didn't run CC last year was because he transferred schools and was not eligible. This year-- it will all come down to smart training and avoiding injuries. The Kauai course is very fast -- and I believe a little on the short side-- so hills (like on Maui and Big Island) will not be a factor. Looking forward to another great XC season. We'll sure miss the updates from Coach Al. God bless him. We mostly follow the ILH runners since our kids go to ILH schools so it's nice to read about what's going on in other leagues. As for D-1 XC talent from last season, in addition to Bryce, Matt Nakamoto (HBA '09) is also running on scholarship at D-1 University of Northern Colorado. We understand from his coach that Matt got quite a few offers due to his academics, performances, and injury free status and actually turned down at least one Pac-10 offer. Matt completely dominated the ILH last year so will be interesting to see who steps up this season. Kamehameha and Iolani always produce contenders. I am helping MileSplit.us keep up it's national rankings. I am adding results from many of the states that Milesplit does not have webmasters for and could use some help. Our rankings are data driven. That data is results. We have a database that helps with these rankings and can show state rankings as well. What I could use the help with is results. I have found a couple of good sites in HI for results but I want to make sure I get them all (or as many as I can). So please send me links to any meets, results, or sites that have results from HI. In most states their is a coach who is the "guru" and I would love to talk with that coach as well. to get input on teams and individuals. Hope everyone has a great season. [quote="RunningFan"]Leilehua increased their bench over the summer. I know that their success last year has spilled over to many more kids out for CC this season. Biggest question mark is Shannon White's return. Believe that is still up in the air. If he does return, he can be a top 5 runner in the State. I will watch the Mules closely over the first few races. Actually, Shannon is back at school in Kea'au on the Big Island. He's a good kid and a terrific baseball player as well. However, there have been 5000 m and 3 mile races in the past couple of weeks in Hilo and my observation is there are at least 4 runners on the Big Island who are ahead of him at this point in time. I would also rate Tialana Greenwell of Honoka'a ahead of Kristin Ali Keith on the girls' side as Tia has beaten her in their last two meetings (2008 state X-country championships and state 3,000m finals). BTW, some were talking about the Footlocker races from 2008 at Mt SAC and Margarito ran extremely well there - finishing fifth in the freshman/sophomore race against runners from 14 western states.